A friend of Arapahoe High School shooting suspect Karl Pierson, who is accused of an 80-second attack that injured one student and ended his own life, said the suspect was a vocal fan of "The Anarchist Cookbook." The student who opened fire last week at a Colorado high school, leaving one girl in a coma before taking his own life, was angry after losing his coveted spot on the debate team and an avid reader of a notorious bomb-making bible, according to a classmate. Joe Redmond, who at one time was a co-captain on the team with the suspected gunman, Karl Pierson, said that Pierson had been reading “The Anarchist Cookbook,” a 1971 book that includes bomb-making instructions. Pierson, a senior, had been reading the book since his sophomore year and sharing it with others, Redmond said. “Speech and debate was his life, and the fact that he wasn’t there crushed him a little bit and made him really tense and angry,” Redmond told NBC News. Pierson showed up at the school, Arapahoe High in Centennial, Colo., at midday Friday with a pump-action shotgun, ammunition strapped to his chest, a machete and Molotov cocktails — and headed for the library. 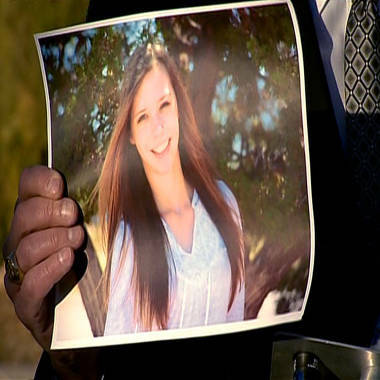 Arapahoe County Sheriff Grayson Robinson holds a picture of Claire Davis the 17-year-old student that was shot during a briefing Saturday, Dec. 14, 2013, at Arapahoe High School in Centennial, Colo.
Alerted to the threat, Murphy left the building, which police praised as a tactical move to lure Pierson outside. Pierson fired one round down a hallway and then shot Claire Esther Davis, 17, who just happened to be sitting nearby with a friend. He killed himself as a security officer closed in on him, police said. Claire was in critical condition, stable but in a coma, her family said Sunday in a statement released through the hospital. Arapahoe students were praying for Claire, who was described as outgoing, athletic and an excellent student. She loves horses and recently placed second in an equestrian competition, The Denver Post reported. A neighbor told the newspaper Claire is also the best babysitter in the community. Friends and well-wishers posted prayers on Twitter, and some students collected money to help pay for her medical expenses. “I feel like it’s going to make us a stronger senior class and school as a whole,” said Chris Davis, an Arapahoe senior who helped organize the fundraising effort. Redmond, the fellow student, said that he spoke to Pierson as recently as Monday and talked to him about returning to the debate team.